The Rapid still doesn’t publish its full budgets on the Internet. When we asked for their 2011 budget, we were told that it was too big to email and that we’d have to come to their office if we wanted to see it. Somehow, nearly every other government in the county manages to post full budgets online, but not The Rapid. NEW: We’ve also posted The Rapid’s annual audits (which The Rapid doesn’t publish). Go here to see them. You can also view The Rapid’s entire list of General Ledger Accounts. This is useful for filing a Freedom of Information Act request for expenses in a particular category. See also The Rapid’s Fact Sheets for more budget and rider data that The Rapid doesn’t disclose on their web site. 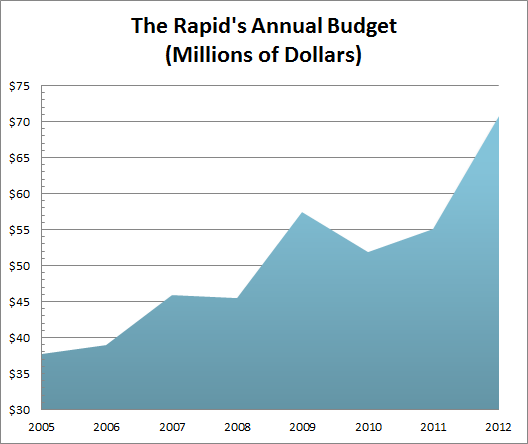 Track The Rapid’s lobbying spending. Currently, they spend $40,000 a year on a lobbying firm.